Thank you for your support and participation with the Vasculitis Patient-Powered Research Network! In three years our Network has grown to over 2,000 participant in 29 different countries representing 13 of the vasculitides. There is strength in numbers. Every participant in the VPPRN helps to make our data become stronger and our community becomes healthier. The VPPRN is a longitudinal cohort study (a study capturing patient data over a long period of time) that provides us the opportunity to follow patients with many forms of vasculitis over numerous years. By asking patients questions regularly about their health, disease flares, and other patient reported data, we can understand how people’s health and lives change overtime. Collecting patient data over time helps us better understand vasculitis and how to combat these diseases. Each and every participant in the VPPRN makes an impact. The more people that enroll and complete all of the questionnaires, the more we learn about the vasculitides and the greater our impression becomes on both our understanding of the disease and the lives of patients. We are building a foundation for ongoing learning and a long-term impact on the care and health of patients with vasculitis. The strength and growth of our continued learning is dependent upon the participation of patients with vasculitis and the dedication to providing data to our Network on an ongoing basis. Since our launch in November of 2014 we have collected longitudinal data and conducted four additional studies, and are preparing to launch six additional studies that are of importance to both patients and researchers. What is a VPPRN Study? VPPRN studies must be scientifically meaningful as well as relevant and important to people affected by vasculitis. “Patient engagement” refers to patients having meaningful participation throughout the research process, from topic selection to design, and conduct, and reporting of research. For a study to be considered a VPPRN study, it must use one or more VPPRN and/or PCORnet resources. The aim of this project was to develop a disease specific quality of life survey for patients with ANCA-associated vasculitis. Quality of life can be measured by questionnaires called patient-reported outcome measures (PROMs), and this is considered an important outcome for clinical trials of new medications. Work disability associated with rheumatic diseases accounts for an important part of the costs of these conditions, in addition to direct treatment costs, especially with biological agents. Interest has been growing in studying work disability associated with rheumatoid arthritis, but only a few studies have investigated vasculitis. VascWork aimed to learn about the impact of vasculitis on employment and income in patients with different systemic vasculitides. The results of this study may help support the development of programs to increase awareness of the disease and improve patient quality of life. The goal of the Journey study is to gain insight into the factors that affect the time to reach a diagnosis of vasculitis and to investigate the pathway involved in ultimately reaching a correct diagnosis. The purpose of the Vasculitis Pregnancy Registry is to learn about the experience of women with vasculitis who become pregnant. In particular, the study consists of several online surveys to assess a) each woman’s vasculitis severity and pregnancy-related experiences, and b) pregnancy outcomes. The purpose of the Healthy Mind, Healthy You study is to examine the effectiveness of mindfulness-based cognitive therapy on well-being in patients with vasculitis. The first aim of this study is to evaluate the comparative risks for serious infections, cardiovascular events (e.g. myocardial infarction and stroke), and incident cancer associated with biologics and non‐ biologic therapies used for the treatment of adult and pediatric arthritis, psoriasis, IBD, and vasculitis. The second aim is to evaluate the comparative clinical effectiveness of various biologic and other medications using a variety of disease‐specific and generic patient reported outcome (PRO) domains. This study assesses how patients with vasculitis weigh the benefit of relapse risk reduction provided by maintenance therapy versus the potential risk of adverse events. The second aim is to assess whether issues surrounding long-term, low-dose prednisone for prevention of relapse is a research question that patients think is important. This particular study stems from and builds upon our Journey study. The main aim of this protocol is to identify diagnostic pathways in large healthcare databases using predictive analytics and machine learning techniques to calculate the risk of having a specific autoimmune or systemic inflammatory syndrome. The second aim is to apply and test the predictive analytic model identified in our first aim to enable a learning healthcare system to calculate the risk of having a specific condition and notify the appropriate physician, and enact change in care. In addition to our current list of VPPRN studies, we are in the process of reviewing and developing several more protocols. All VPPRN studies are patient-centered and are of importance to patients and physicians. We continue to develop new ways to utilize our infrastructure to support novel research methods. Our research portfolio covers a wide range of research areas to help improve the lives of patients with vasculitis. In 2013 the idea of a research network for vasculitis in which patients partner with investigators to create a network and develop research protocols was a dream. In 2014, that dream came true with the launch of the Vasculitis Patient-Powered Research Network. 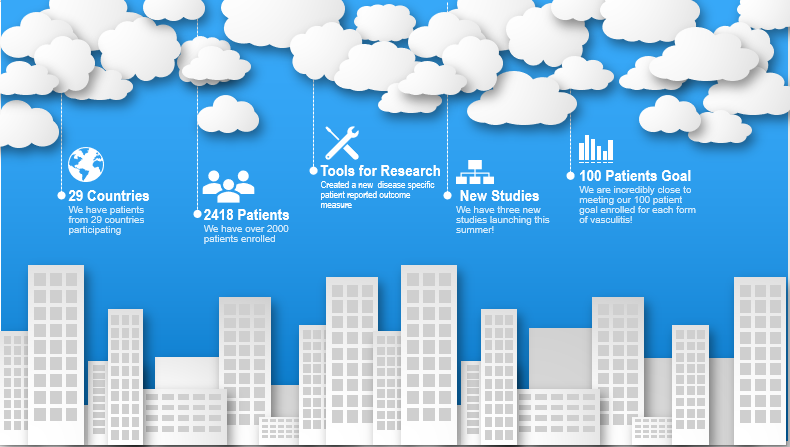 The dream of the VPPRN in 2014-15 was to launch one study and enroll 500 patients. In 2015, we launched three studies and had enrolled over 1,000 patients. We realized we had easily achieved our dreams and now it is time to really DREAM BIG! With 2,000 patients enrolled from over 29 countries and an extensive research portfolio, we are ready to dream bigger, push harder, and achieve more! If you are already a member of the VPPRN, we thank you for dreaming big and participating in something that will improve the lives of patients with vasculitis. If you haven’t joined the VPPRN but you want to contribute to a bigger dream and brighter future for patients with vasculitis, join us today! It is free, online, and you can participate at your level of comfort. Every person that enrolls makes a difference. Do something today that you will be proud of tomorrow. Dream Big!